As the Bharatiya Janata Party (BJP) celebrates its 37th foundation day, Prime Minister Narendra Modi took to the social media to congratulate the party workers on the occasion and thanked people for their support. 'Guided by the Mantra of Antyodaya, our efforts to serve India especially the poor & the marginalized continue with great vigor,' Prime Minister Modi tweeted. 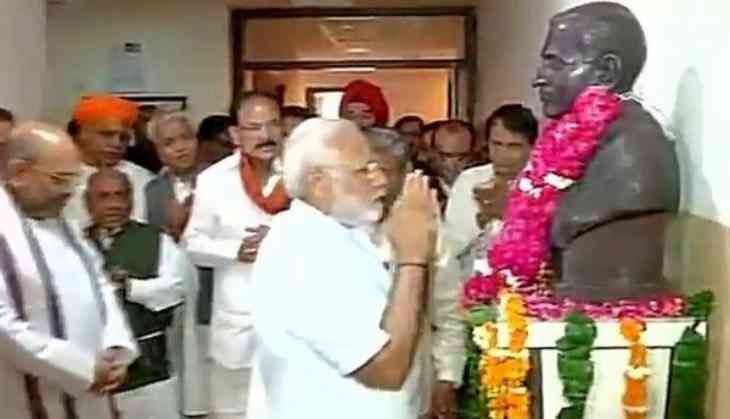 'Before my day long Jharkhand tour, going to BJP HQ to offer tributes to our inspiration, Pt Deen Dayal Upadhyaya Ji on BJP's Sthapana Diwas,' he said in a series of the tweet. Talking on the occasion, Union Minister for Information and Broadcasting M. Venkaiah Naidu said the BJP had become a nationalist party to a common man's party. 'Today is a very important day for the BJP workers across the country. Today is the foundation day of the Bharatiya Janata Party. We have now become 37-year-old. In this long journey of 37 years, the party has become a national party and finally, a common man's party. Starting from a humble beginning, today, we are the largest party in the world with more than 11 crore members,' he told the media.